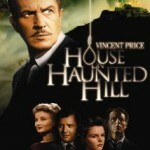 House on Haunted Hill 1959 Review – A wife of a millionaire plans to have a haunted house party with friends but her husband decided to invite strangers over to the party instead. Each person is told that if they make it through the night they will receive $10,000. The relationship between the husband and wife is rocky at best and there’s a lot of anger and threats thrown about. Put a couple that hate one another into a haunted house with various strangers…somebody is going to get it but by whom…or what? This is a great movie for children starting out with horror flicks. There’s no scary monster, no blood…it’s good starter movie. There is a la-hot of screaming…lots and lots and lots of screaming! Vincent Price is awesome in his part as always. Some acting is over the top and others seem very realistic. There were quite a few unanswered questions at the end of the movie but overall, good flick! House on Haunted Hill 1959 View Through – Good Lord! I’m so glad I’m not 8! I would have just peed myself! I once saw an episode of I’ve Got a Secret (it was a rerun from GSN…I wasn’t alive then) and the ladies secret was that she screamed for movies! This guy is in quite a few horror movies I’ve seen, Watson Pritchard. That was an abrupt ending. I think I prefer Vincent Price in his dramatic rolls. AWESOME idea to invite people to a haunted house and have them ride in “funeral cars”. Lance, aka, the professor from Nanny & the Professor. No, I don’t find her particularly pretty. Odd, all I can find out about Carolyn Craig is she died from a gunshot wound. I can’t find out if it was accidental, suicide, murder…not a ding dang thing. If a reader finds out please make sure to leave a comment letting me know! Nobody is talking. I think in real life you would all be chatting it up as you walked in. That’s natural. Even as strangers you would be excited, nervous, etc. and you would be talking about it. Funny, they all split up and then all came back together at the same time in the same spot LOL. I would have so much fun doing something like this … on either end … as host or the invited. Creepy guy LOL. Flirt much? Five wives…”four I think…so far”. I like her! I wouldn’t have freaked out over the door. I would have thought it was part of the “show”. The chandelier, on the other hand…muhahahahahaha. Annabelle is pretty…calming voice, very smooth. Hmmm, as I’m watching…she isn’t even close to ugly but I think it’s her voice that makes her seem so attractive. Oh, they’re so in love…not. “I deserve it” “no proof”…she’s sparky. If people have tried to kill you in the past I would uh I’d think you would go out of your way to be nice. How did he know that was in there and why pull it out? Freaky people. I would never ask somebody to fix me a drink at a stranger’s house. Locked door, no way out…nobody ever thinks of fires…what if somebody has a heart attack or something? Lush much, Pritchard? The ceiling bleeds, unique. There’s a stupid person (or 50) in every horror movie. Clumsy, clumsy, clumsy. Bet that would smell to high heaven. Who would go in there again? Lance? Yes. Nora? Not a chance LOL. Very smart of you, Professor. WOW! He like teleported to that other room LOL. OH OLD WITCH LADY AGAIN! Lance, feel free to think she’s nuts. I don’t believe you because there’s only 1 way out and I was there. I hate huffy girls. I mean, I would know what I saw but I would also understand where he was coming from. I would also think that, for the party, they had set things up to freak us out. Why were you creeping at the top of the steps? Jealous wife? I wonder if Annabelle feels like an amazon. I’m not tall (5′ 6″) but I always feel like a mountain near short girls. The professor is a flirty type of guy. Melancholy usually works LOL. Forward much? You know what? She has a mullet! She looks like a white Wanda Sykes. She sounds constipated. ADD? Distracted from a severed head, leave your room and then investigate a curtain? DOH! You didn’t scream like that at the freaking head but you do over somebody that sounds like they want to help? Stupid girls. Old Crazy Witch Woman is supposed to be there 🙂 I don’t think she’s hysterical…by any definition. Pretty Annabelle. Love the dress. She is pretty, that little sideways glance. I guaran-freaking-tee you that Steve would find a way out for me. I love the word “darling”. It didn’t sound stupid in this era…but it does today 🙁 I wonder why that is. Honey and baby sound fine but darling…it doesn’t work. You owe somebody a bullet. This seems like an amazingly stupid thing to do. Please stop wiggling that gun in front of my face. Mr. Pritchard? You’re drinking a lot. Please give me your gun. Omen? A woman’s head? Looked like a caveman to me. Lady. You. Are. Nuts! Safety in numbers. You should all stay together. No Nora. Ghosty. It still looks like a caveman. How do you know Nora is even missing. I bet it isn’t Nora…too obvious. I told you! Why would you scream if you had planned to kill yourself. You scream if somebody is trying to kill you. Annabelle screamed. Nora needs to take a shot or two…sedative or vodka! Maybe 1 of each. So maybe it was Nora that screamed and not Annabelle but the timings matched up? Naw, that can’t be it. Don’t tell her that! Maybe Nora killed Annabelle…Nora is a bit “woo hoo” now. Everybody is spying on everybody. Vincent, you sure are defending this woman you hated…you’re protective of her in her death. So it wasn’t a suicide! I knew it. Is she really dead? I’m going to bet no. My husband! I think the only 2 people you could suspect of murdering her would be Vincent or Nora. Vincent because they hated one another. Nora because she’s unstable. No, she’s alive. She’s in on it with someone. Let’s see, the only people we’ve seen her alone with are Vincent, Nora and Lance…so she’s in on it with somebody else. You would think it a male so Pritchard or Trent. Pritchard could be in on it out of revenge for deaths in the past. Trent, an affair. Maybe she’s in on it with Ruth as a woman-to-woman thing? “I’ll help you with your gambling debt if you’ll help me kill my husband”. Ghosty at your door, Dr.? Blood is back! I really like Ruth’s jewelry. Dun-dun-dun…secret panel! You got in…you can get out! LIGHT OUT! Snaky rope comin’ in my window! CUTE FREAKING SHOES! Ghosty snaky rope! OH MY! For read ghosty snaky rope…there’s a ghost at the end! Well, I was thinking this was going to be more a mystery movie than a ghost movie but the rope wouldn’t be able to be wrapped around her feet like that if this was all staged. And Annabelle would have moved fast. But the monster hand is too stupid. Nobody comes to this poor screaming girl? JUST as I was about to type “don’t let the organ start”…it starts. Too campy. Then again, this was during the campy age. Where has the dear doctor been? The doctor. The doctor is acting suspicious. He’s in on this with somebody. Nope, can’t be that … the rope. Hmmm. But he doesn’t seem on guard. Hmmmm, in there, locked door, with Annabelle. I KNEW IT! But the rope? And getting from outside the window to hanging in the hall. Nora. you are the slowest looker arounder I’ve ever seen. Announce yourself, Vincent. See the gun? Announce. UH OH! I would OH SO NOT back up to that thing. Roll Vincent’s body…don’t pull it. Hmmm, I’m betting Vincent isn’t the one that went in.